It is an old problem. Many California community associations cannot motivate their owners to participate or even vote at association elections. We have had clients that have been unable to obtain a quorum for director elections for more than 20 years. Even my own association recently reported a failure to achieve a quorum and decided not even to bother holding a second meeting, knowing that the chances of obtaining a quorum was remote. Some condominium and homeowner associations have the ability under their governing documents to reduce the required percentage for a quorum at adjourned meetings, often from 50% to 25%, but even then some of those associations cannot get 25% of the owners to vote. This is an interesting idea. Over the years, several of our firm’s association clients have asked us whether they could offer incentives to get their owners to vote. These associations were proposing that each owner that voted would get some cash or perhaps a discount on their next assessment. We have generally advised our clients that we did not think that this would be an appropriate use of the association’s money. Most associations’ governing documents specify that the monies received from assessments must be utilized for the maintenance, repair and other expenses of the association. We have been hard-pressed to find any authority to utilize association funds to “pay” owners to vote or for a lottery prize. And, as the article I referenced above indicates, “depending on the source of City funds, the idea could require a ballot measure.” If the City would have a difficult time justifying the use of taxpayer money for a lottery prize to get its citizens to vote, an association would probably fare no better. Offering a prize (via lottery or some other random selection method) to cast a vote would not be the same as offering money to vote for a particular board member. These laws do, nonetheless, show that paying people to vote is not really sanctioned by the law. But perhaps offering a prize may not be the same as paying people to vote. 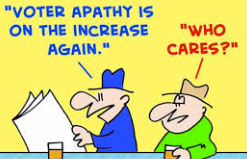 Homeowner apathy is a problem. Perhaps a lottery or prize is not a bad idea. Instead of utilizing association funds, perhaps members of the board or management can solicit prizes from the association’s vendors or others. For example, perhaps the association’s landscape vendor will offer to trim a homeowner’s trees as a prize. Or maybe the painting contractor that is painting the exterior of the association will offer to paint one or more rooms in a unit as a prize. And before you send me comments, I am not suggesting that the landscaper or painting contractor be selected on the nature of the prize they offer or even whether they would offer a prize. I would not even ask them until after they have been working at the association. Alternatively, the association could ask local restaurants if they want to offer a prize in exchange for the association sending out a notice to all of the owners regarding the prize offered by that restaurant. These are just some suggestions as to the type of prizes that could be obtained without having to utilize association funds. We suggest that before an association uses its funds to pay for prizes or incentives for owners to vote, the board should obtain an opinion from the association’s legal counsel regarding the authority and legality of the board to do so. The last thing a board wants to encounter is a breach of fiduciary duty claim for misappropriation of association funds or electioneering (and a challenge to a vote on a CC&R amendment, special assessment vote or board election). David Swedelson is a condo lawyer an HOA attorney, and a community association legal expert. David can be contacted via email at: dcs@sghoalaw.com.